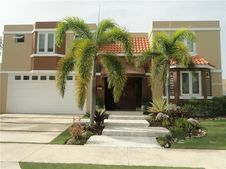 Beautiful home in centrally located Los Paseos de Dorado, with many restaurants, supermarket, cinemas, beach close by. Completely equipped with kitchen and laundry appliances, air conditioners, power generator with transfer switch. Could be furnished or partially furnished. Great for entertaining with tropical swimming pool, terrace with outside bar, full bathroom and extra storage. Kitchen with walk-in pantry and extra storages, and viewing entertaining area. Master suite 19x16 with 12x12 custom walk in closet and marble bathroom with jacuzzi and separate shower. Flex room on first floor can be an office, guest, family or game room adjacent to double ceiling foyer. Currently occupied. Showings with previous appointment. Road #22 West until exit #24 make a right into road 693, make a left on CVS, pass Walgreens, then Applebee's and Efron Avenue, next community on he left, Paseos De Dorado, enter until roundabout until Paseo Los Corales, straight to the end on the right. The details on 577 Mar Caribe: This house located in Dorado, PR 00646 is currently for sale for $4,200. 577 Mar Caribe is a 3,000 square foot house with 4 beds and 3.5 baths that has been on Estately for 3 days. This house is in the attendance area of Jose De Diego, Ricardo Arroyo Laracuente, Luisa M Valderrama (San Antonio), Jose Santos Alegria, Marcelino Canino Canino, Espinosa Kuilan, Jacinto Lopez Martinez, Luis Munoz Rivera, Elemental Alfonso Lopez Garcia, and Ladislao Martinez. Listing Courtesy of: MFRMLS and DREAMS HOMES REAL ESTATE.